by The Rt. Rev. Alexander Schmemann, S.T.D., LL.D, D.D. On second thought, however, I became convinced that such an answer would be not only useless, but even harmful. Useless, because all such “formal reasons” – scriptural, traditional, canonical – are well known to the advocates of women’s ordination, as is also well known our general ecclesiological stand which, depending on their mood and current priorities, our Western Brothers either hail as Orthodoxy’s “main” ecumenical contribution or dismiss as archaic, narrow-minded, and irrelevant. Harmful, because true formally, this answer would still vitiate the real Orthodox position by reducing it to a theological context and perspective, alien to the rthodox mind. For the Orthodox Church has never faced this question, it is for us totally extrinsic, a casus irrealis for which we find no basis, no terms of reference in our Tradition, in the very experience of the Church, and for the discussion of which we are therefore simply not prepared. Such is then my difficulty. I cannot discuss the problem itself because to do so would necessitate the el ucidation of our approach -not to women and to priesthood only – but, above all to God in his Triune Life, to Creation, Fall and Redemption, to the Church and the mystery of her life, to the deification of man and the consummation of all things in Christ. Short of all this it would remain incomprehensible, I am sure, why the ordination of women to priesthood is tantamount for us to a radical and irreparable mutilation of the entire faith, the rejection of the whole Scripture, and, needless to say, the end of all “dialogues” . Short of all this my answer will sound like another “conservative” and “traditional” defense of the status quo, of precisely that which many Christians today, having heard it too many times, reject as hypocrisy, lack of openness to God’s will, blindness to the world, etc. Obviously enough those who reject Tradition would not listen once more to an argument ex traditione…. But to what will they listen? Our amazement – and the Orthodox reaction is above all that of amazement – is precisely about the change and, to us, incomprehensible hastiness with which the question of women’s ordination was, first, accepted as an issue, then quickly reduced to the level of a disciplinary “matter” and finally identified as an issue of policy to be dealt with by a vote! In this strange situation all I can do is to try to convey to you this amazement by briefly enumerating its main “components” as I see and understand them. The first dimension of our amazement can be termed “ecumenical.” The debate on women’s ordination reveals something which we have suspected for a long time but which now is confirmed beyond any doubt: the total truly built-in indifference of the Christian West to anything beyond the sphere of its own problematics, of its own experience. I can only repeat here what I have said before: even the so-called “ecumenical movement,” notwithstanding its claims to the contrary, has always been, and still is, a purely Western phenomenon, based on Western presuppositions and determined by a specifically Western agenda. This is not “pride” or “arrogance.” On the contrary, the Christian West is almost obsessed with a guilt complex and enjoys nothing better than self-criticism and self condemnation. It is rather a total inability to transcend itself, to accept the simple idea that its own experience, problems, thought forms and priorities may not be universal, that they themselves may need to be evaluated and judged in the light of a truly universal, truly “Catholic” experience. Western Christians would almost enthusiastically judge and condemn themselves, but on their own terms, within their own hopelessly “Western” perspective. Thus when they decide — on the basis of their own possibly limited and fragmented, specifically Western, “cultural situation” — that they must “repair” injustices made to women, they plan to do it immediately without even asking what the “others” may think about it, and are sincerely amazed and even saddened by lack, on the part of these “others” of ecumenical spirit, sympathy and comprehension. Personally, I have often enough criticized the historical limitations of the Orthodox mentality not to have the right to say in all sincerity that to me the debate on women’s ordination seems to be provincial, deeply marked, and even determined by Western selfcenteredness and self-sufficiency, by a naive, almost childish, conviction that every “trend” in the Western culture justifies a radical rethinking of the entire Christian tradition. How many such “trends” we have witnessed during the last decades of our troubled century! How many corresponding “theologies”! The difference this time, however, is that one deals in this particular debate not with a passing intellectual and academic “fad” like “death of God,” “secular city,” “celebration of life” etc.– which, after it has produced a couple of ephemeral best-sellers, simply disappears, but with the threat of an irreversible and irreparable act which, if it becomes reality, will produce a new, and this time, I am convinced, final division among Christians, and will signify, at least for the Orthodox, the end of all dialogues. How else can one explain their readiness to accept what may prove to be a passing phenomenon and what, at any rate, is a phenomenon barely at its beginning (not to speak of the women’s liberation movement, which at present is nothing but search and experimentation) as a sufficient justification for a radical change in the very structure of the Church? How else, furthermore, are we to ex plain that this movement is accepted on its own terms, within the perspective of “rights”, “justice,” “equality,” Etc. — all categories whose ability adequately to express the Christian faith and to be applied as such within the Church is, to say the least, questionable? The sad truth is that the very idea of women’s ordination, as it is presented and discussed today, is the result of too many confusions and reductions. If its root is surrender to “culture”, its pattern of development is shaped by a surrender to “clericalism.” It is indeed almost entirely dominated by the old “clerical” view of the Church and the double “reduction” interest in it. The reduction on the one hand, of the Church to a “power structure,” the reduction on the other hand, of that power structure to clergy. To the alleged “inferiority” of women within the secular power structure, corresponds their “inferiority,” i.e., their exclusion from clergy, within the ecclesiastical power structure. To their “liberation” in the secular society must therefore correspond their “liberation” i.e., ordination, in the Church. That is why in conclusion of this letter I can only confess, without explaining and justifying this confession by my “proofs.” I can confess that the non-ordination of women to priesthood has nothing, absolutely nothing, to do with whatever “inferiority” we can invent or imagine. In the essential reality which alone constitutes the content of our faith and shapes the entire life of the Church, in the reality of the Kingdom of God which is perfect communion, perfect knowledge, perfect love and ultimately the “deification” of man, there is truly “neither male nor female.” More than that, in this reality, of which we are made partakers here and now, we all, men and women, without any distinction, are “Kings and priests,” for it is the essential priesthood of the human nature and vocation that Christ has restored to us. This priesthood is Christ’s, not ours. None of us, man or woman, has any “right” to it; it is emphatically not one of human vocations, analogous, even if superior, to all others. The priest in the Church is not “another” priest, and the sacrifice he offers is not “another” sacrifice. It is forever and only Christ’s priesthood and Christ’s sacrifice — for, in the words of our Prayers of Offertory, it is “Thou who offerest and Thou who art offered, it is Thou who receives and Thou who distributest…” And thus the “institutional” priest in the Church has no “ontology” of his own. It exists only to make Christ himself present, to make this unique Priesthood and this unique Sacrifice the source of the Church’s life and the “acquisition” by men of the Holy Spirit. And if the bearer, the icon and the fulfiller of that unique priesthood, is man and not woman, it is because Christ is man and not woman….. 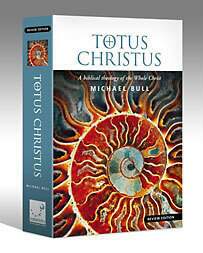 I just recently received this monster book in the mail this past week, Totus Christus by Australian native Michael Bull. “This book is an unofficial introduction to the groundbreaking interpretive work of James B. Jordan and Peter Leithart – theology you can eat and drink.“ Over the course of the summer, and as long as time permits, my colleagues, Dr. Jack Simpson, Mr. Carl Wegner, and myself will be offering a review of this work. Mostly this review will be for the sake of the author who asked us to do so, so that he can make a great work better. It will be more of a negative review so that he can correct anything that we might find difficult to understand, or that we think he might be able to clear up better, or if we think he is straight up wrong about something. So with that, we offer to you a review of Totus Christus: A Biblical Theology of the Whole Christ.